So I have had my hands full trying to find lots of low-key activities for her to do. Keeping her occupied and out of mischief. I spotted these Offray elastic double strand headbands at the craft store and thought a sparkled up headband would be something we could do together. Offray elastic headbands, sequins strands, & hot glue. 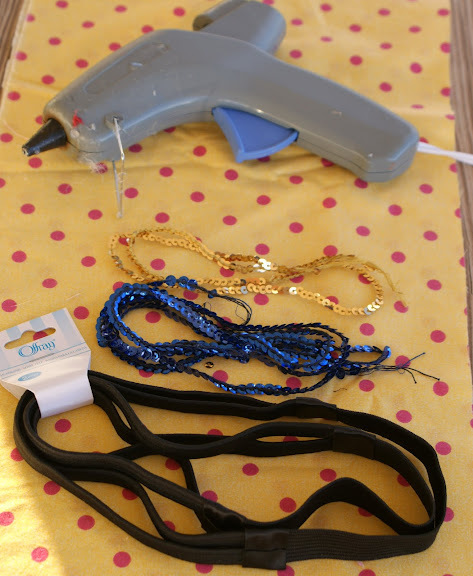 I ran a small amount of hot glue onto the headband and pressed the sequins into the glue. Working in small sections at a time and trying not to burn my fingers as I went along. Lucky for me no burned fingers. My little one got to pick out the embellishments and I glued it all together. When I had both strands of the headband covered with my sequins I wrapped some ribbon over the ends of the trim for a finished look. Added a little hot glue to the edge to secure in place. New sparkled up headbands for both of us. I added some extra flat braided trim to my headband before adding my sequins. You can find all different kinds of trim at the fabric store. This was such an easy and fun little project to do with my busy little Drama Queen. I just love watching her make something new. These are so pretty on both of you!!! I have short hair now, but have seen people wearing pretty headbands with short hair, too. I might try this for an upcoming wedding. Thanks so much… This would look so pretty with short hair too. Glitzy and cute! I adore the sweet pictures of you and and your charming daughter. What stores sell the headbands? I found these ones at Walmart… I’m sure Hobby Lobby or Michael’s have some too… Hope that helps.